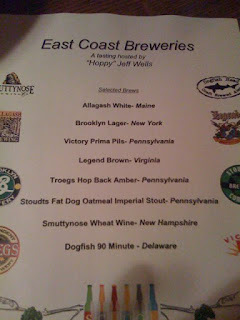 Thursday evening I had the pleasure of enjoying an "East Coast Breweries" tasting at Capital Ale House. Presented by "Hoppy" Jeff Wells, the evening was a whirlwind tour of some of the East's most stalwart breweries. We learned about their history and their contributions to American craft beer. In addition to Jeff, Capital Ale House's Jacab Brunow and Chris Holder were on hand to share their own knowledge, and to pour the beers for us. As fate would have it, Jeff left Washington, DC just in time to sit in southbound traffic on I-95, and was slightly delayed. No worries, our Capital Ale House hosts broke out some special beers to share. Tröegs Flying Mouflan and Southern Tier Inequity were served while we waited. This was a treat for me as I had not tried either of these beers. Flying Mouflan is an American Barleywine with a nice fruity, hoppy flavor that I enjoyed very much. Southern Tier Inequity is described as an "Imperial Black Ale." An Imperial IPA crossed with a mild stout is the best way I can describe it. Both of these beers are ones I'd like to try again. After these two treats I was half hoping Jeff was delayed a bit longer! Soon Jeff arrived and we got down to the subject at hand. "Hoppy" Jeff Wells posseses a wealth of knowledge and experience. He currently is a Specialty Account Sales Manager for a DC craft beer, wine and spirits distributor, in addition to being a contributor to Ale Street News. In addition, Jeff has worked in all three "tiers" of alcoholic beverage distribution; from brewery to distributer to bar owner. Throughout the evening he shared the history, trivia, and inside stories of the craft beer world, especially the East coast. After the surprise appetizers, we worked our way through the scheduled beers. Allagash White (Maine), Brooklyn Lager (New York), Victory Prima Pils (Pennsylvania), Legend Brown (Virginia), Tröegs Hop Back Amber (Pennsylvania) Stoudt's Fat Dog Oatmeal Imperial Stout (Pennsylvania), Smuttynose Wheat Wine (New Hampshire), and Dogfish Head 90 Minute (Delaware). That's a fine representation of "old" East Coast breweries, I'm sure you'll agree. The Legend, Smuttynose, and Dogfish Head beers were served from draft, the rest were bottled. The Smuttynose Wheat Wine was another new beer to me. This Old Ale / Barleywine style ale is dark caramel in color with a strong alcohol aroma. The rich, slightly sweet, caramel and dark fruit flavors combined for a beer that went down very smoothly. Certainly a fireplace sipper at around 11% ABV. This is very limited release beer; Fredericksburg Capital Ale House received just a single one-sixth keg which they had been saving for tapping at this event. A rare treat indeed. At the end of the session, Jeff brought out a beer he called his "tardy pass", a 2008 Vintage magnum of Chimay Grande Réserve (Blue Label). A perfect finale to the evening. There were about 21 folks in attendance at the "East Coast Breweries" tasting. The majority of the folks were Capital Ale House employees there to learn more about craft beer. That is both good and bad. On one hand, it's great that Capital Ale House strives to have well-informed employees, and the employees are motivated to learn. On the other hand, where was everyone else? Chris told me he knows there is a big craft beer interest in the Fredericksburg area, yet they don't often get large turnouts for events they hold. I'll admit I don't get to as many as I'd like to, and vow to do better. I hope others will follow suit. The cost of admission for tonight's event was a mere $8.00. That's a bargain, yes? More tastings and dinners are planned at Capital Ale House and I hope to see more of you there in the future. The "East Coast Breweries" tasting was a very enjoyable way to spend a few weeknight hours. It was an informal and friendly crowd and everyone seemed to have a great evening. I look forward to next time. See some (camera phone) photos from the event here. man, bummer I missed it, I totally would have attended this event had I known earlier.